Chef Jamie Oliver calls it pink slime. We feel it's more like pink goop. Either way, the ammonium hydroxide soaked pink crap beef is vomit inducing. Thankfully, you won't have to eat it anymore. Kind of. 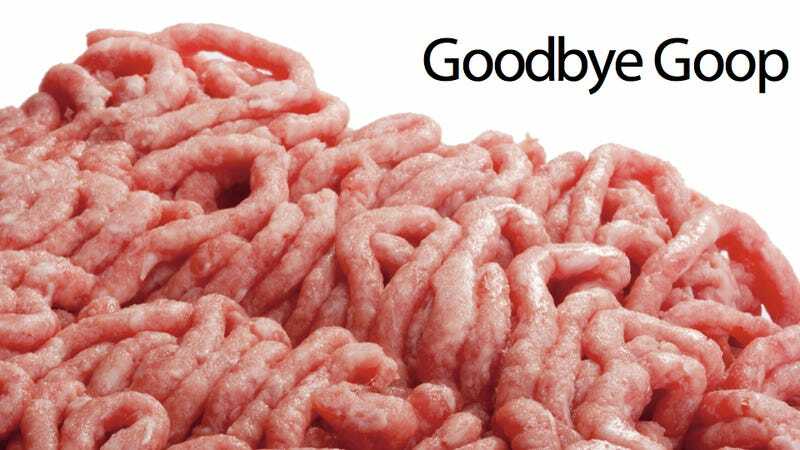 McDonald's has finally caved to the pressure and will ditch the use of the pink goop beef in its burgers. What's gross about the pink goop beef, made by Beef Products Inc (BPI), is that it's actually made of of "beef trimmings" which are the undesirable, leftover crap of a cow that's better fit for dogs than humans. Taking it one step further, the beef trimmings are then processed and soaked in ammonium hydroxide and churned into ground beef. Agh, it's disgusting to even think about. This pink goop beef actually makes up a sickening 70% of America's ground beef! It's taken a while but McDonald's has finally decided to step up its standards in the US (it never used pink goop meat in the UK) and will no longer use the pink BPI meat in the US of A. It might taste fine but pink goop meat is so bad that US Department of Agriculture microbiologist Geral Zirnstein doesn't even consider "the stuff to be ground beef" and considers "allowing it in ground beef to be a form of fraudulent labeling." Oof. And we enjoy this madness.